When you like your jewelry to carry meaning or when you are looking for a personal present for that special person in your life, personalized jewelry is what you’re looking for. Whether you buy precious or semi precious stones jewelry, personalized creations are extra special because no one else will have the same piece. And we like to be a little extra sometimes, don’t we ladies? Scroll down for inspiration on how to personalize your jewelry. Birthstones are a subtle and pretty way to wear personalized jewelry. You can add your birthstone to a bracelet, wear it as a pendant necklace or create drop earrings with the gemstone. 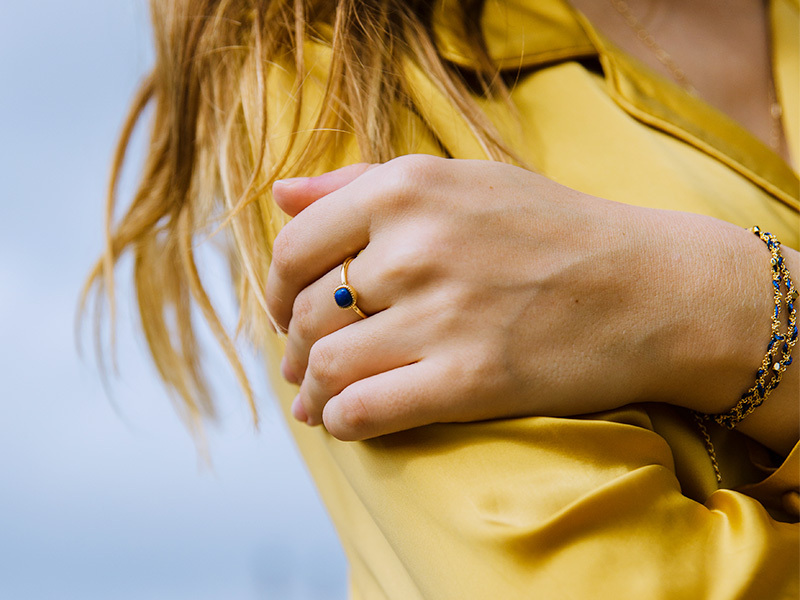 The birthstone doesn’t necessarily have to be your own. You could also choose to wear the birthstone of someone dear to you like your grandmother or your boyfriend. Simply do a quick online search to find a birthstone chart. Wearing two birthstones is another romantic jewelry idea. It can be a way to show your bond with someone but still keep it more low key than wearing their name on a necklace. You could incorporate your birthstone and your fiancee’s birthstone in an unconventional engagement ring. Or show that you and your sister are two peas in a pod with a matching bracelet that holds both your birthstones. Engravings are the most popular form of personalized jewelry for a couple. Many couples will choose to engrave their wedding band. Common engravings are names, the wedding date or a short phrase that has significance to the couple. You don’t have to wait to get married to have your jewelry engraved. Engraving other pieces of jewelry will look just as pretty. 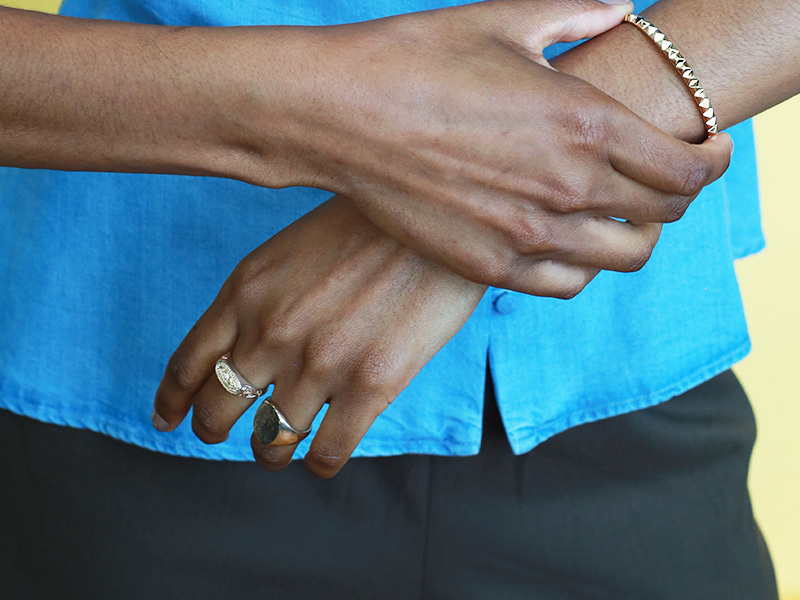 A cuff bracelet is a perfect backdrop for engraving. Wider pendants like a dog tag or bar are also ideal elements for engraving. Engravings work best on precious metals like gold, silver, and platinum. Alternatively, you could have a leather jewelry piece carved with lettering for an edgier style. Another subtle way to create personalized jewelry is by having your own logo. Think of a symbol that characterizes you. This could be anything from a four-leaf clover to show your Irish heritage to your spirit animal or a paintbrush because you’re an artist. Whichever symbol you feel a strong connection with could become your personal logo. A logo can be stamped onto jewelry pieces to create personalized jewelry. You can stamp your personal logo on a solid gold ring or have the logo stamped unto silver studs. If you have a classic look then lockets are the jewelry pieces that will compliment your style. Lockets make a necklace more intricate and give your look a vintage touch. Traditionally, a photo is placed inside the locket. Placing a photo of a baby inside a locket makes this a beautiful present for mothers. Even a mother whose children are already teenagers will appreciate the memories a baby photo holds. You are welcome, you just got your mother’s day present sorted. Name necklaces and bracelets are making a comeback in jewelry trends. If you don’t want the full name then initials work too. This is the classic example of personalized jewelry and we still love it. You can personalize a bracelet with your own name, wear your boyfriend’s initial on a pendant necklace or engrave a ring with your maiden name. A new trend in jewelry features hoop earrings with your name on them. This is a stylish way to show your confidence. If you prefer your personalized jewelry to be ready-made, there are still options for you. For example, a charm bracelet is a very personal piece that doesn’t require any extra work from your jeweler. Simply shop for the charms that symbolize what matters to you. Many costume jewelry brands will also release a line that is designed to be worn in pairs. Think of friendship necklaces with pendants that join together or friendship bracelets. These jewelry pieces represent a thoughtful present for when someone’s birthday comes around. Another way to create personalized jewelry that doesn’t require extra work from your jeweler is to stack ready-made jewelry pieces. By that, we mean that your own combination of layered necklaces or set of stacked rings is a way to personalize your jewelry. What matters is what each individual piece means to you. Have you decided what’s going to be your choice for personalized jewelry? Don’t be shy to express yourself with jewelry and stand out. Personalized jewelry is all about showing pride in yourself. Need more jewelry inspiration? Read our other articles as well. By the way, don’t forget to check out Ana Luisa’s unique designer jewelry collections to view limited-edition pieces at fair prices.